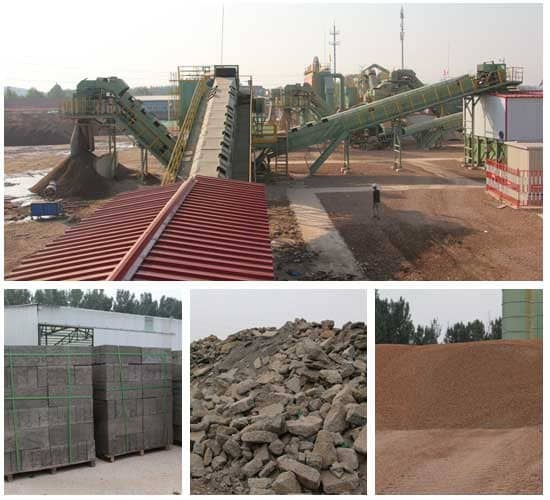 The construction waste recycling is the environmental protection of the old buildings, old buildings and other once abandoned concrete, stone brick blocks and some steel materials. The recycling of construction waste has been regarded as a key project of national development, construction waste. Large quantities of processing equipment enter the market, and rational use of building aggregates to further promote urban construction. The production of construction waste in China is staggering. The total amount of construction waste discharged in China is about 3.55 billion tons per year, accounting for about 40% of urban waste. And the decade that will generate a large amount of construction waste in the next decade is expected to reach 7.3 billion tons in 2030. A construction waste production line in Xi'an is currently undergoing the production of secondary construction waste. The Dahua Heavy Industry Equipment has met the requirements for crushing and recycling in this construction waste production line battle. The equipment used in the field is the type. Crusher, impact crusher, sand making machine and other equipment, combined with the treatment status of construction waste, improve the crusher cavity type and internal structure, higher output than ordinary crushing equipment, low energy consumption and durable equipment. After coarse crushing, medium fine, fine crushing, and screening a series of processes, the material particles reach 0-5mm, 5-10mm, 10-20mm, 20-30mm, and the particles are even and full, which has been well received by users.